As posted in our last blog “Affordable Wedding Venues in South Florida” if you are not Paris Hilton or JLo, you might be going through the same situation as many brides, trying to find the best prices possible for your wedding ceremony and reception. As I mentioned before, doing some of the wedding planning yourself can save thousands, yes! Thousands you can use for something else. First, what you are going to need is TIME! Searching for the right place for your wedding venue is going to take some of it. Any banquet hall/hotel is going to charge you around $40 per person plus taxes, just for the food, tables, chairs and basic linens. Everything else, you have to pay for it; decoration, lighting, draping, centerpieces, ect, ect… Mmm! Are calculating? Yes, a lot! Before I help you find your wedding venue, let me tell you an experience I had decorating a wedding recently. I was able to decorate and plan a complete wedding reception with a budget of $3500 for 100 guests, this is what it included: Food, tables, chairs, complete table set up, dishware, glasses, silverware, linens, chair covers, servers, centerpieces for 11 tables, whole room draping, ceiling draping with lights, uplighting, torches, a romantic bonfire, security and the venue rental. Sounds good for that amount of money, right? Good question, where? Where would like to have your wedding reception at? Beach, historic, garden, lake view? I am going to recommend you to take a look at this website: Florida State Parks, here you will find a complete list of the State Parks available for weddings. Most of them offer wedding ceremonies sites and pavilions for your wedding reception. Pavilions? Yes!!! Trust me, if you want to save some compared to a banquet hall or hotels, theses pavilions might be a very good option, all they need is an “Extreme Makeover”, some wall and ceiling draping, uplighting, some chairs, tables, ect, ect. Some companies offer these services for an affordable price. Like I said, some of the wedding planning has to be done by you or your bridesmaids but it will save you some money. How about the food? Just contact some catering companies. They will deliver the food for you and offer a serves at additional prices. John U. Lloyd State Park: Beach location, perfect wedding ceremony site and the Manatee Pavilion recommended for receptions. Oleta State Park: Lave view and beach location, receptions sites available, ceremonies by the beach. Bill Baggs Cape Park: Historic beach location, lighthouse, perfect wedding ceremony site. Hollywood North Beach Park: Historic beach location, wedding ceremonies and pavilions for receptions. Hugh Taylor Birch State Park: Historic, gardens site. T.Y. 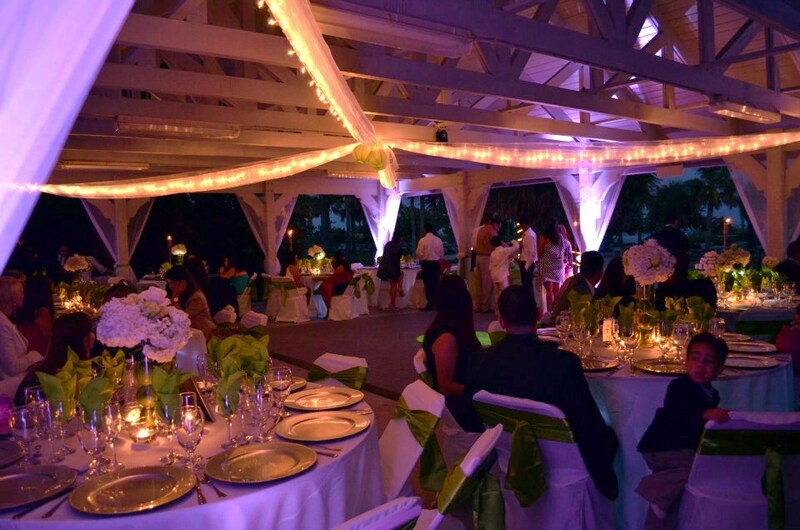 (Topeekeegee Yugnee) Park: Lake view gazebo for wedding ceremonies. Was it helpful? If you are planning your wedding and need help with design and décor, contact us! Reblogged this on Proeventdecor's Blog. How To Plan A Wedding in One Day?